In an uncertain economic climate, the Student Money Management Center will work to teach students how to avoid personal financial disasters with a series of educational lectures and interactive workshops beginning Monday (Feb. 23). Financial Literacy Week will kick off that day with lectures on banking products at 11 a.m. in the Lowman Student Center Theater, a FAFSA and financial aid workshop from noon to 2 p.m. in the LSC Atrium, a money booth contest for students to catch cash at noon in the LSC Mall Area, and a comedic financial seminar at 6 p.m. in the LSC Theater. Among Tuesday’s highlights are a budget and savings lecture at 9:30 a.m. in the LSC Theater, an interactive budgeting seminar from 2-4 p.m. in LSC Room 320, an “Ultimate Money Skills” workshop at 6:30 p.m. in the LSC Theater. On Wednesday, author Tamara Draut will discuss “Why America’s 20- and 30-Somethings Can’t Get Ahead” at 11 a.m. in the LSC Ballroom, in addition to workshops on scholarships at 2 p.m. in the LSC Theater, and identity theft at 3 p.m. in the LSC Theater. Thursday’s activities include a lecture on consumerism and financial literacy at 9:30 a.m. in the LSC Theater, a Financial Literacy Vendor Expo from 11 a.m. to 2 p.m. in LSC Room 320, another FAFSA and financial aid workshop at 11 a.m. in the LSC Ballroom, and a lecture on good versus bad credit at 2 p.m. in the LSC Theater. Activities will culminate on Friday with an economical (free) lunch, during which financial literature will be passed out, from 11 a.m. to 1 p.m. in the LSC Mall Area. For more information on any of the Financial Literacy Week events, or for a complete schedule, contact the SMMC at 936.294.2600, smmc@shsu.edu or visit http://www.shsu.edu/~smmc/. Clinical psychologist Deborah Michel will discuss how cultural standards of beauty adversely affect the well being of girls and women on Monday (Feb. 23). “Beauty and The Beast: Culture and The Quest for Beauty” will be held at 5 p.m. in Academic Building IV’s Olson Auditorium. Michel, a clinical faculty member at the Tulane University School of Medicine in New Orleans, has specialized in the treatment of eating disorders since 1992. The event is hosted by Sigma Lambda Gamma National Sorority in recognition of National Eating Disorders Awareness Week. Two professors from the University Of Coahuila in Mexico will visit “Global and Cultural Diversity” during two presentations on Thursday (Feb. 26) and Friday (Feb. 27). Francisco Martinez and Gilberto Aboites will discuss “Mexico, Agriculture and Cultural Diversity” in Spanish on Thursday, from 12:30-1:30 p.m. in Lowman Student Center Room 315. On Friday, the two will present an English lecture on “Globalization In The Mexican Poultry Industry,” from 1-1:50 p.m. in College of Humanities and Social Sciences Building Room 242A. The lectures are sponsored by the sociology and foreign language departments, as well as the College of Humanities and Social Sciences. For more information, call 936.294.1512 or 936.294.1441. Claude Lopez, assistant professor of economics at the University of Cincinnati, will discuss her paper “Testing for Group-Wise Convergence with an Application to Euro Area Inflation” on Thursday (Feb. 26). The spring Economics Seminar Series Lecture will be held from 3:30-5 p.m. in Smith-Hutson Building Room 134. The paper, co-written with David Papell, introduces new statistical methods to determine whether inflation rates across the various countries that make up the European Union converged after the adoption of the Euro, as they were supposed to, according to Darren Grant, SHSU assistant professor of economics. “Previous methods have been unable to resolve this question, but this paper gives strong evidence that inflation across the EU countries did indeed converge as it was supposed to,” Grant said. Lopez has taught at the University of Cincinnati since 2003. She earned her master’s degree from the University de Toulouse I, in France, and her doctorate from the University of Houston. For more information, contact Grant at 936.294.1265. Jack Staggs, a SHSU professor emeritus who is considered to be one of the 10 founders of counseling in the state of Texas, will discuss “A brief overview of the history of counseling in Texas and some recommendations for beginning counselors” on March 2. The lecture, open to the public, will be held from 6-7:30 p.m. in Teacher Education Center Room 131. Refreshments will follow his presentation in TEC Room 111-E.
A “legend in our parts,” Staggs came to SHSU in 1960, serving as director of the department of education for 13 years, during which time he increased faculty numbers from 11 to 40, according to associate professor of counseling Daniel Eckstein. Because of his contributions to the counseling program, in 2004 Staggs was honored as the namesake of the Dr. Jack S. Staggs Counseling Clinic, a training clinic for doctoral and master’s students. Staggs “stands as a model of outstanding generosity” through his service to multiple organization and his financial contributions to SHSU in such areas as establishing a number of scholarships, as well as a dissertation award, Eckstein said. Prior to Staggs’ talk, counseling adjunct professors Van Wiesner and Barbara Bryant, as well as retired professor Gary Hood, will provide information on the free counseling clinic services available to the community as well as relate personal experiences of having Staggs both as a teacher and as a colleague prior to his retirement. Nominations for SHSU’s annual Excellence in Teaching Award will be accepted online through 3 p.m. on Friday (Feb. 27). Nominations may be made by faculty, staff, students and alumni, and the recipient will be awarded a cash stipend of $5,000. The Excellence in Teaching Award is a very prestigious award, representing the highest level of teaching achievement at Sam Houston State University, according to committee chair Thomas Chasteen. Past winners include: William Abbott, Elizabeth Andrews, Gary Bell, Harry Bohan, David Burris, Charles Capps, Adrian Cooley, Richard Cording, Caroline Crimm, Earline Dolive, Jerry Dowling, Frances Elmer, Coralie Emmons, Frank Fair, William Fleming, Gaddis Geeslin, David Gerling, Kenneth Hendrickson, John Holcombe, Rita Huff, Virginia Irvin, William Jasper, James Johnson and Stanley Kelley. Also, Doug Krienke, Maniam Balasundram, Valerie Muehsam, Thom Murray, Mary Ann Nolteriek, James Olson, Mary Frances Park, Phillip Parotti, Ralph Pease, Wayland Pilcher, Mozelle Powell, Debra Price, Daniel Reeves, Marcus Rigby, Carol Sangster, John Snelgrove, Victor Sower, Donald L. Stalling, Susannah Ural, Bill Waldron, Laverne Warner and Maynard Yoes. Nominations may be made online at https://ww2.shsu.edu/vote02wp. For more information, contact Chasteen at 936.294.1533 or chasteen@shsu.edu. The Dean of Students’ Office and the Alcohol and Drug Abuse Initiative will take students on a virtual journey through a drunk driving accident on Wednesday (Feb. 25). The “2009 Save A Life Tour,” a simulator that allows students to experience drunk driving accidents, will be held from 10 a.m. until 4 p.m. in the Lowman Student Center Atrium. The tour will show incidences with varying levels of blood alcohol concentration and a crash scene involving passengers and other cars in different traffic venues. The simulator also provides the ability to implant a split-second delay on the part of the impaired driver that negatively affects responsiveness. This delay allows participants to experience virtually every tendency that a driver would endure while alcohol impaired. In addition, tour guides include those who have personally experienced drink-driving tragedies as passengers in drinking related crashes and by losing loved ones through these life-changing incidents. The event is open to all students, faculty and staff members, as well as community members. Students can also receive co-curricular credit and SWAAT points for participating in the tour. For more information regarding the tour, call assistant dean of students Jeanine Bias at 936.294.3026. Faculty members who want to send their classes to the “Save A Life Tour” may do so by contacting Keathley at 936.294.1171. With spring break just around the corner, the Alcohol and Drug Abuse Initiative will show students how to strike out alcohol and drug use on Monday (Feb. 23). “Spring Break Training” will be held from 10 a.m. to 2 p.m. in the Lowman Student Center Mall Area and 2:30-4:30 p.m. in LSC Room 315. During the event, Recreational Sports’ associate director of programs Franklin Harrison and others from Rec Sports will sign students up for “Team Rec Sports,” after which students can participate in a mini-baseball camp, pick a starting line-up in a fantasy draft and show off Wii baseball skills for their team. In addition, Harrison will take students back in time to learn about major league baseball players who struggled with drugs and alcohol. Though they are using professional athletes as examples, Joyner said students who follow or admire them can relate to them by seeing them go through alcohol or drug abuse, which is something “regular” people go through every day. “Students will be able to see first hand and relate better when they realize that the top athletes they watch everyday may be someone who abuses alcohol and drugs and have lost their career or life to substance abuse,” she said. Students who anticipate graduating in August are to file degree applications by March 4 with the Registrar’s Office online through Sam Web. Those who fail to apply by the deadline will be assessed a $25 late application fee in addition to the $25 graduation fee. Applying late may also result in names not appearing in the commencement program or the honors program. “I recommend this detailed study of North American and Latin American postmodern poetics; an excellent publication,” the Argentinean publishing house said in its review. Mallen’s book “Poesía Del Lenguaje: De T. S. Eliot A Eduardo Espina” was published in 2008 by Editorial Aldus, a major publisher of works on literary criticism in Mexico. The book analyzes Espina’s poetic style in relation to “language poetry," an avant garde literary group that emerged in the United States in the late 1960s and early 1970s. Health and kinesiology faculty, staff and students dressed in red on Feb. 12 in support of American Heart Month this February. The health and kinesiology department “went red” on Feb. 12 to warn younger audiences of the results of unhealthy habits they may participate. 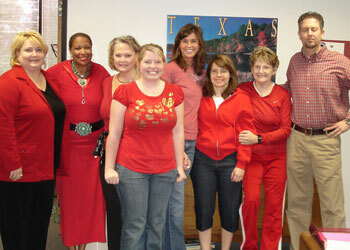 The department’s faculty and staff members, as well as students, dressed in red that day to promote cardiovascular health as part of the American Heart Association’s annual “Go Red” campaign. February is American Heart Month, designed to raise awareness of the nation’s No. 1 killer, heart disease. In addition, students in the health education class “Communication Skills for Health Professionals” developed ‘The Wall of Knowledge,” which will be on the walls in the hallway of the Health and Kinesiology Center through the end of the month. The wall addresses risk factors, preventive measures, signs and symptoms of heart disease. “Most ‘Go Red’ campaigns are directed to a population over 35,” said Susie Stone, health clinical faculty member who teaches the HED 392 class. “We wanted to assist the typical 21-25-year old to look at their current health habits and see into the future where they might fit in regarding risk facts for cardiovascular disease. “The posters highlight risk factors such as smoking and obesity - both of which are modifiable, and a good time to work on that is when you are young,” she said. The “Wall of Knowledge” will be up through the end of February.